An advantage of our holiday home is the exposed location in a residential area. In this ensemble, you will find architecturally varied buildings, almost all of which are listed buildings. The holiday home itself is the garden house of a villa, which, like the main building, was built in neoclassical style. Both buildings and the courtyard, fence and garden are listed buildings and form a surface monument. The main building is still a building and cultural monument. Our guests especially appreciate the holiday home, as it is a detached building. 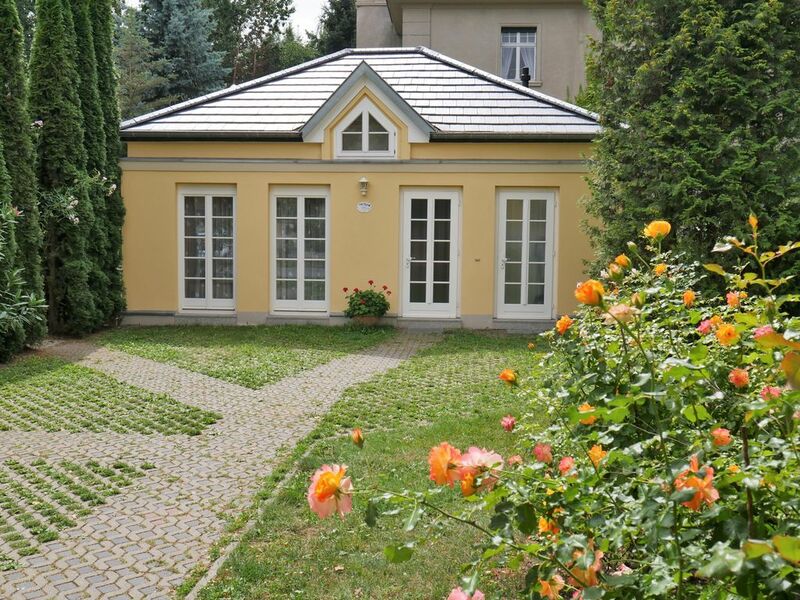 The 700m2-large romantic garden of the house is available for your use. On the large terrace you can relax undisturbed, read, barbecue or sunbathe. Our little guests are especially happy about the playground, which is located in the garden. However, they can not run away because the garden is completely fenced and can be locked if necessary. In November 2017 our holiday home was completely renovated. The external dimensions of the house are 8.5 * 7m. From a touristic point of view, our holiday home offers you the possibility to reach everything within a short time on foot due to its convenient location between castle, Brühlpark and city center. So you need only 5 minutes to the castle and the collegiate church with the famous cathedral treasure. The center of the city, with its 1300 half-timbered houses a World Heritage Site, can be reached in 10 minutes and the Bruehl Park, which adjoins the villa area and is one of the 'garden dreams' of the historic parks in Saxony-Anhalt, in 5min. In the vital house skin and naturopathic consultations can be perceived. Quedlinburg is a charming holiday destination and at the same time the starting point for a multitude of sights in the area. Enjoy your holiday in the Harz.